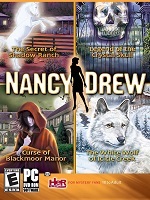 The Nancy Drew PC games series has been published by Her Interactive since 1998, with over 20 game titles to date. The computer game versions of the Nancy Drew books, are adventure games in style, where you play Nancy Drew, moving her around the virtual room or location - finding hidden objects, talking to suspects, collecting clues, solving puzzles and interacting with characters or using items in your inventory together to crack the mystery. The Nancy Drew PC games series include hidden object games, puzzles and strategy and also point-n-click adventure mystery games. Whilst previously you had to buy the game on CD-ROM, you can now also get the full versions of the PC games online via download. My posts are split into three with the games listed in order of release date. I love adventure, mystery and detective games and the high production standards of the Nancy Drew game developers, HerInteractive have really delivered some top-notch mysteries for fans like me to enjoy! In the posts, I've included my own review and ratings. And pointed out the games I have enjoyed the most. Some of them have even warranted a top detective PC game score of 5 out of 5 stars - make sure you check out my second post, in particular, as these include some of my favourite, best Nancy Drew games! Best Nancy Drew Games released 2000 to 2003. Top Nancy Drew Games from 2004 to 2007. Best Nancy Drew Detective PC Games released 2008 to 2010.